It may be September, but if the heat and mosquitoes are any indication, summer isn't winding down any time soon. There's still plenty of time left to sit outside and enjoy the sunshine (just load up on that bug spray!) and sip on some fruity beverages. 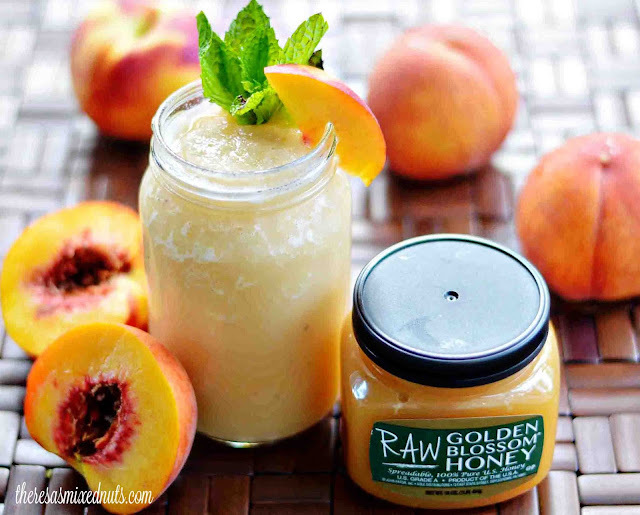 I had a fridge full of peaches that needed to be used up before they started to go bad, so instead of putting them to use in a dessert, I thought it would be fun to make a delicious Peach Frappe recipe from Golden Blossom Honey. I used their new Raw Honey in this recipe to keep it sweet and healthy. It has just the right amount of sweet and slush, but you could make it even more slushy by freezing the peaches before blending them. Also, I used almond milk instead of cow's milk for a creamier consistency. Are you hoping summer sticks around a little longer, or are you ready for fall's cooler days? It looks good! Yummy dish! They did say we shall have a long and warm Autumn, the Indian summer. Nom on the peaches, but with almond milk... never tried it, it is way too expensive here, but I have a feeling I'd like it. If you can find almonds cheap, you can make your own. Though, almonds here tend to be pretty expensive, it's cheaper for me just to pay $3 for a carton of almond milk. Yes, the melon days are over, but think of all the yummy fall fruits and veggies that are about to hit. I can't wait for the pumpkin and squash and apple season to be in full swing. Good way to help beat the heat, as those bugs try and also to use you as a treat. That sounds like Heaven in a glass! We have peaches for days in our area, so I can't wait to make this. This does look refreshing. I want! I'm going to be sad when peaches go out of season. At least there's the frozen ones. This looks so good. It's the perfect end of summer drink to drink while soaking up the last of the good weather. Pretty sure this is the dreamiest idea for a frappe I've seen. Brilliant way to use the peaches. We appreciate a delicious frappe or smoothie all year around, especially when they sound this good! I always use honey as a sweetener when making them for the family. A peach frappe sound so good right now! This sounds like the perfect drink to relax with. Oh delicious! A peach frappe would be so nice. I'm liking the idea of using raw honey! 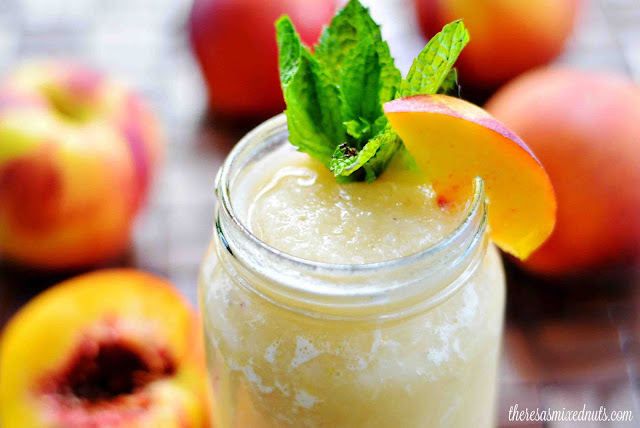 Peach frappe sounds so deliciously refreshing as a sweet healthy treat and to beat the humidity and heat. I am looking forward to the cooler weather. It can't come soon enough. This sounds absolutely delicious. I love good honey! Hmm, I have never had a peach frappe. It does sound yummy! Wow, this looks delicious! Don't mind if I do! I love raw honey and so did my husband! 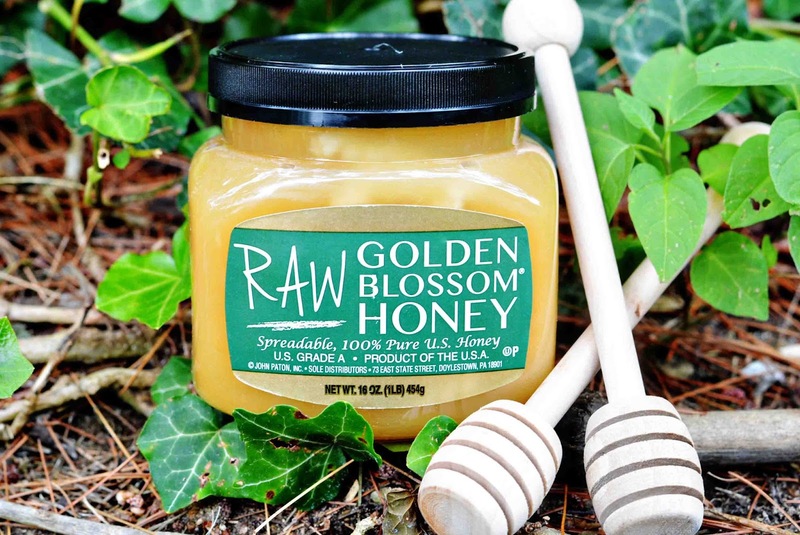 We are big fans of raw honey! I am sitting in my backyard right now and your peach frappe would be a great addition. I truly love being able to infuse honey into any dish or drink whenever possible so this recipe is simply perfection for me and I can't wait to try it! Yay! This is a must-try for me. I love peaches and I haven't tried a peach frappe before. OMG, I need to try this! I love peaches! And I love using raw honey to almost any dessert and drinks! This looks very refreshing and relaxing. I love peaches AND honey and together it's bliss! Wow I've got to get my hands on the golden blossom honey. This drink looks amazing! I love to use honey as a sweetener in my smoothies. This frappe looks so delicious I can not wait to try making one. 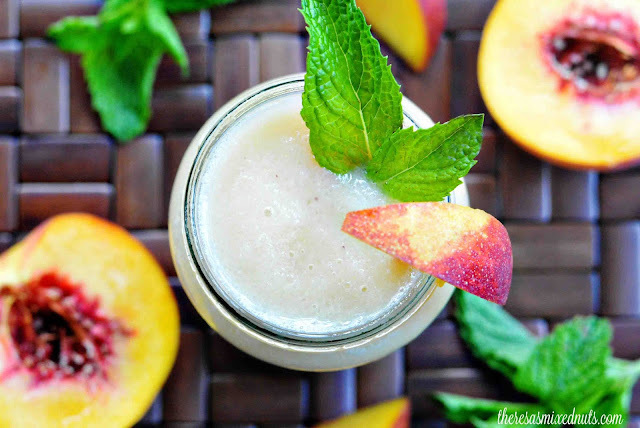 I haven't tried a peach frappe before so let me thank you for sharing this recipe. I need to make this before I say good bye to the summer! This drink made me crave for peach! I think it's awesome that you used honey as a sweetener. This is perfect for the summer, indeed! Getting the peaches in a small jar is what you can wish for in a day. Indeed the recipe looks delicious and I am sure that it will be giving the perfect peach taste.